The elusive Charlie Hebdo that was published after its offices were attacked is coming to Barnes and Noble. The New York Post reports that 20,000 copies of the memorial issue are being sent to the states, and the book store chain will receive a portion of them. Despite the horrendous attacks, Charlie Hebdo published the issue the very next week. It sold out quickly once it hit newsstands. In France, five million copies were purchased. In New York, book stores Albertine, Book Culture and McNally Jackson each sold 100 copies each. 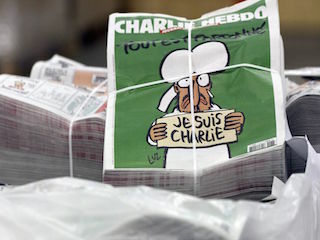 The new shipment of Charlie Hebdo could be available as early as today, but most stores are expected to receive the issue next week.